There is soft tissue swelling anterior to the tibial tuberosity and loss of the sharp margination of the patellar tendon. 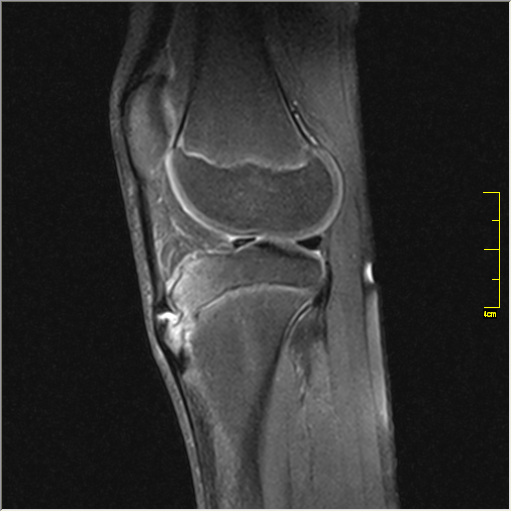 Fragmentation of the tibial tuberosity is evident. Osgood-Schlatter disease is a common, self-limiting, but painful and disabling disorder involving the patellar tendon-tibial tubercle complex most commonly affecting boys between the ages of 10 and 15 years. Patients present with pain, soft tissue swelling, and tenderness in the anterior knee in the proximity of the tibial tuberosity. Recently, the MRI findings have been categorized into five stages, consisting of normal, early, progressive, terminal, and healing. In the early stage, MRI signs of marrow edema can be seen in one third of cases with a low signal on T1- and high signal on T2-weighted studies. Progression is noted by the partial avulsion of the secondary ossification center, whereas the terminal stage consists of complete separation. Healing is characterized most significantly by resolution of the soft tissue changes. Persistence of the ossicles may be asymptomatic but, infrequently, may precipitate persistence of pain into adulthood. Rarely, genu recurvatum and patella alta may complicate the disorder. Essentials of Skeletal Radiology 3rd Edition by Yochum & Rowe. Musculoskeletal Imaging: THE REQUISITES, 3rd edition.